With Fission, audio editing is no longer a chore. You can join files, crop and trim audio, and rapidly split up long files. Fission is streamlined for fast editing, and it works without the quality loss other audio editors cause. If you need to convert between audio formats, Fission can do that too. Rapidly export or batch convert files to the MP3, AAC, Apple Lossless, FLAC, AIFF, and WAV formats. Fission has all your audio needs covered. Finally, simple audio editing has arrived. 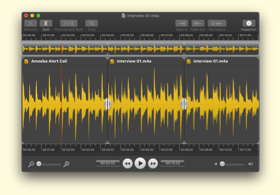 Fission offers all the standard audio editing options you need right at your fingertips. Unlike overly complicated competitors, there's no clutter or bloat. Fission never causes quality loss when it edits, even with the MP3 and AAC formats. It's like magic, and it's something only Fission offers! 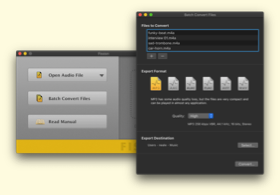 Fission's batch convertor lets you convert dozens of files at once, to any of the most popular formats: MP3, AAC, Apple Lossless, FLAC, AIFF, and WAV. Any file Fission can open can be saved directly to MP3, AAC, Apple Lossless, FLAC, AIFF, or WAV. 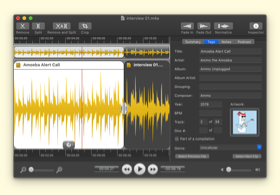 Make enhanced podcasts with AAC or MP3 chapters using Fission. Your listeners will love you for it! Cutting out audio couldn't be easier. Just select and cut! If you need to edit FLAC files, look no further than Fission. Got a small portion of audio to save? Highlight it, click Crop and you're done. With a simple drag and drop or copy and paste, you can join two or more files into one. Automatically split files based on silence. It's perfect for LP and DVD recordings. Highlight a section of audio then adjust the gain with the Gain slider. Split files using cue sheets, or export your edits to a cue sheet file. Fade audio in and out to create pleasing transitions. Give audio files a constant volume level with the Normalize function. With Fission's Split Points, you can split and save to get multiple files. Edit audio down, then choose “Save as iPhone Ringtone” to get custom tones for all your iOS devices. After you've finished editing a file, you can publish it directly to a SoundCloud account. Sharing is a snap! If you buy songs from the iTunes Music Store, Fission can help losslessly edit them. 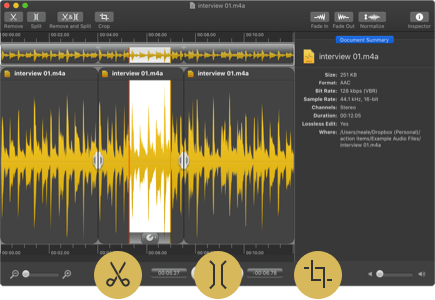 Record a podcast with Audio Hijack, then edit it down in Fission. Record a web stream, then trim out unwanted ads and other bits. Take one long file and split it into individual songs with Smart Split. Handy! Note: Before purchase, audio saved with Fission will be degraded via audio fades. Already own an older version? Get a discounted upgrade to Fission. If you've ever been in that position of having to edit an MP3 and not wanting to lose quality, Fission is the one. Fission is headed to your Downloads folder! This download serves as both the free trial and the full version of the software. Unlock the full version by entering a license key purchased from our store.